NASCAR Winston Cup Series racing at Phoenix International Raceway just keeps getting bigger, better and faster. PIR first opened its gates in 1964 and since that time has earned a reputation as one of the top facilities of its kind in the nation. Since that historic day when the track greeted its first visitors, history and tradition have fired on all cylinders. It has been a stage for some of the great names in the sport, as Bobby and Davey Allison, Richard Petty, Cale Yarborough, Mario and Michael Andretti along with A.J. Foyt are on the long list of winners there. Track president Emmett "Buddy" Jobe has kept pace with the growth of the NASCAR Winston Cup Series in Phoenix, repaving the facility in 1993 and adding 12,000 grandstand seats the past two years. In addition to the improvements, the beauty of the local surroundings make it a wonderful place to visit. Set at the base of the Estrella Mountains, near the Salt and Gila Rivers, it is as much a fixture of the local landscape as its natural counterparts. More upgrades and improvements, including an overall beautification program, are in the works, making Phoenix racing's Desert Jewel. 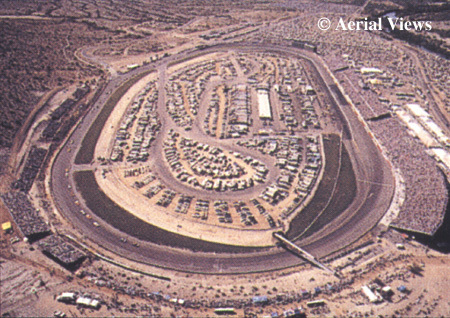 Since 1964, Phoenix has seen it all: NASCAR Winston Cup Series cars, NASCAR Busch Series Grand National Division cars, Indy cars, dirt cars and sports cars give the Desert Mile the most varied schedule of any track in North America. Location: Six miles south of Interstate 10 via any of three highway exits -- Litchfield Road, Estrella Parkway or Cotton Lane. All access roads are well-marked with directions to the track. Avondale, Ariz. - The City of Avondale is considering a sports and entertainment zone to help finance an expansion of Phoenix International Raceway, according to the Arizona Republic. PIR, which hosts NASCAR races in Avondale twice a year, needs the city to create the appropriate zoning so it can develop its property into a major regional and national destination, the newspaper reported. Development options include restaurant and entertainment venues, hotels and resorts and racing-related light-industrial facilities, such as those used for the research, development and testing of racing vehicles. City planners told the newspaper that PIR needs flexibility to react to development opportunities. Planned-area-development zoning is too rigid because it requires developers to lay out specific plans, while the new zoning district would allow for a more market-driven approach. The city anticipates PIR developing its property "very, very long-term in the future," Tracy Stevens, Avondale's planning manager, told the Republic.